Over the two weeks since I last posted on the topic of Assignment Two, I have made some limited progress on that original concept; given some serious thought to a second idea; and then, just a few days ago, come up with a third option that will, I think, prove to be the one I take forward for submission. Starting off with the original concept, I did produce another version that repositioned the bars and arranged them in a way that resembled a window. I continue to see possibilities in this approach, but there are issues that would need to be addressed – I think – to give it a quality look. The sea isn’t right. It should shimmer to give a sense of the Mediterranean heat. That involves using an image where the sun is more or less directly opposite the camera and reasonably high in the sky. I experimented at a local reservoir when out for a walk. One thought would be to drop something like this into the bottom of the version above, but because the water isn’t actually stretching away to the horizon, it would never look right. I could find an opportunity to create an image at the seaside. On the face of it, that is a relatively straightforward approach; but it would need to be suitably sunny day with a coastline facing South into the sun – not impossible by any means, but would take a bit of planning and isn’t going to happen quickly. I could use a stock photo, as Eileen suggested in a comment on my earlier post. I even bounced that idea off my tutor & he agreed that it would, in these circumstances, be a legitimate approach. Looking at several contemporary book covers confirms that this is the most common solution for designers. So, that option remains – though it doesn’t feel entirely comfortable in the context of a photography degree. I also feel that, to work effectively, I would probably need to use a more appropriate face. I even had a look around to see if there is a local photographic model agency – but since my options for the assignment have now broadened, I don’t think I’ll need to pursue that any further. In essence, this first concept is a good one, which I could work with, but which is going to take quite a bit more time and organisation to bring about in a properly professional format i.e. something better than this basic ‘sketch’ version. I have also been mulling over a second contemporary option. 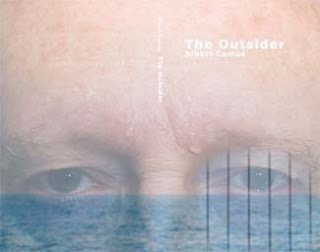 This partly came about from thinking about who actually buys copies of The Outsider. Because it is a ‘classic’ novel, not many people, if any, are going to pick it up and make an impulse purchase. In fact, students of literature are likely to be the most frequent purchasers. So I began to wonder how the novel could be presented in a 21st century context. Working on the idea that technology might be a driver for alienation in today’s world (the equivalent of Camus’ bright light an heat) and linking it to Meursault’s behaviour at his mother’s funeral (or at least society’s interpretation of his behaviour), I came up with this. 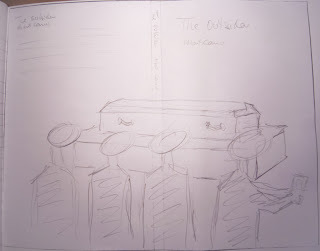 A row of people, dressed in black, are facing a coffin on a dais, with their backs to the camera. The person on the right is turned to one side and is sending or reading a text message on a mobile phone. I’m guessing that would be just the kind of thing a 21st century Meursault might do, and that it could easily be misunderstood by those around him. Then my other contemporary twist on the story would be to make that person a young woman! This concept appeals to me a lot – but it has the very obvious downside that it is even more difficult to set up than the first option. Getting access to a coffin and four or five people who were willing to dress up in black and able to make themselves available for such a shoot – well, could be done, but likely to take some time. I think, if I were a professional photographer working with a designer on a genuine assignment, I’d be quite keen to pursue this one. As a Level Two distance learner working on my own, I’m less inclined! Actually, reaching that conclusion made me reflect on my whole motivation for doing what I’m doing. Am I just backing off from these two ideas because it’s too much trouble & does that throw into question my commitment in how I approach my studies. Or, on the other hand, as a part-time, mature, ‘2nd level’ distance learner, is my second assignment important enough to start putting other people to a lot of trouble, as would be necessary for the second option. And anyway, if my instincts are to create in isolation, should I be pursuing concepts that fit with that approach. Or is that just a convenient ‘get-out’? And, were I to make that extra effort, would I discover that I can work in more challenging and demanding ways and ultimately get more out of it? They’re worthwhile questions. Either fortunately, or because I started thinking that way, I have now come up with option three, which I think has the potential to deliver a sound result, fit with my ‘need’ for something that is under my control, and hopefully show off my photographic capabilities as well. 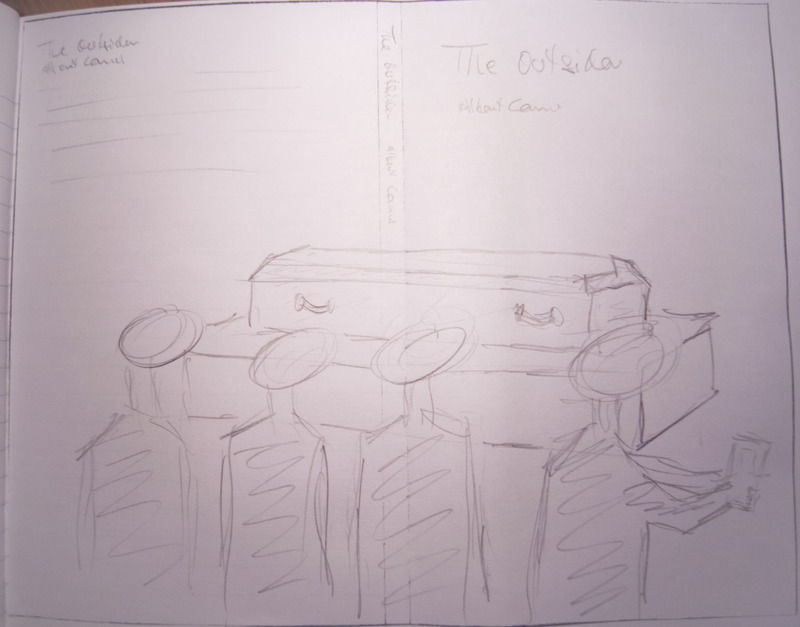 It is a relatively simple conceptualisation of the notion of ‘the outsider’ in a form that I can create in a sort of ‘table-top’ scale, but which might also reflect some other specific aspects of the novel. I’m working on how to execute it – the ‘props’; the scale; the ‘set-up’; the lens; the lighting etc – but I won’t go into further detail yet. Stay tuned! Tease! ; -) Am now very curious as to your next version and will indeed stay tuned.